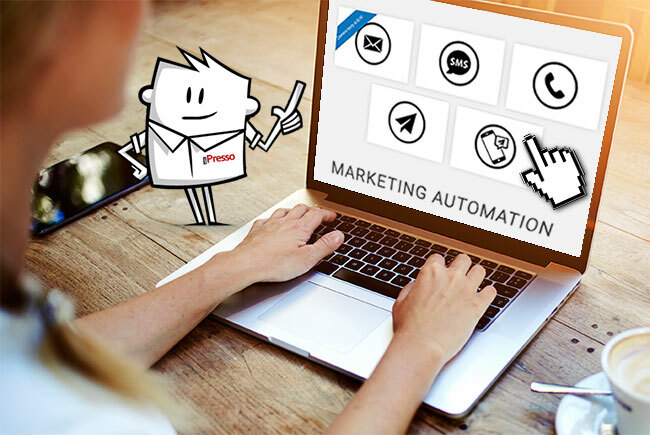 Marketing automation systems provide marketers with the tools they need to effectively communicate with customers. Their operation is characterised by multichannel approach, which includes such channels as email, text and voice messages, and pop-ups. Some of the new features include such forms of communication as web push and mobile push notifications. Multichannel communications is all about making sure that the audience is presented with relevant message that is delivered through the most convenient communication channel and at the most appropriate moment. Customers expect to receive personalized, tailored offers and messages adjusted to their preferences and needs. That’s the only way marketeres can capture their attention. Email marketing is still the best performing channel, according to 41% of marketers surveyed in the DMA’s latest Email benchmarking report. With iPresso, marketers are able to deliver personalized, targeted and individualized e-mail messages to precisely defined target audiences. The whole process of designing such messages is easy and intuitive thanks to the iPresso Studio wizard that leads marketeres step-by-step of creating their communications. The options of email marketning in iPresso also include performing A/B/X tests to select the best version of a message. SMS campaigns are one of the most effective channels of marketing communication with customers. iPresso provides advanced tools to personalize the content of such a message, define the sender’s name and generate real-time delivery reports. Automated SMS communication is especially useful in cases of delivery of reminders and confirmations concerning e.g. car service appointments or visits to a dental clinic. Through personalized and customized SMS messages and reminders, company makes sure that the customer will not miss the appointment or decide at the last moment to choose a competitor. This feature enables marketers to react in real-time to actions of recognized and anonymous users who visit company’s monitored websites. Actions on sites feature allows to display dynamic website content adjusted to users’ traits and behaviours. Hence, the proper message will reach a clearly defined target group of visitors in real-time. Based on the information gathered in the MA system about earler activities of particular users (e.g. opened e-mails), the company may prepare individualized pop-ups with information on discounts and display them to their most loyal users (e.g. those who often open e-mail sent to them).